How Does Isagenix Work for Weight Loss and Improved Health? Before starting an Isagenix program, we encourage customers to understand exactly how Isagenix works. We’ve provided a complete guide for how Isagenix works for weight loss, nutritional cleansing, and improved health and wellness. Isagenix’s weight loss programs are designed around a combination of cleansing and meal replacements. By alternating between Shake Days and Cleanse Days, Isagenix’s 9 and 30-day programs work by releasing toxins from the body and reducing caloric intake. This combination is effective in both burning fat and maintaining losses, unlike other health products that offer unsustainable results. On Isagenix Shake Days, two out of three meals are replaced by delicious IsaLean or IsaLean Pro Shakes. These shakes are supplemented by a 400-600 calorie meal as well as two 150 calorie snacks. Meals can be customised in certain situations to provide extra calories and nutrients. On Isagenix Cleanse Days, meals are replaced with a series of four cleanses and several small snacks. Designed to release impurities from the body, these cleanses are made from natural ingredients like aloe vera that effectively detoxify internal systems and organs. Cleanse Days put your body in the optimal condition for losing weight, while Shake Days effectively burn fat for quick weight loss. Isagenix users often report losses of 3-9kg over the course of a 30-day program; the best part is that these losses are completely sustainable because of the program’s natural ingredients. 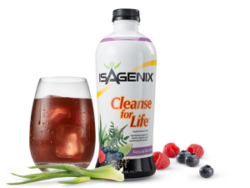 How Do Isagenix Nutritional Cleanses Work? Isagenix Cleanse for Life can be used in two different ways depending on the goals of the customer. For a boost in cardiovascular and mental health, daily cleanses help to remove toxins and encourage basic internal functions. For weight loss and a more significant reset deep cleanses can reverse months of poor habits and the buildup of impurities. Daily Cleanses – For everyday cleanses customers consume one serving of Cleanse for Life, typically in the morning or before bed. Completing an Isagenix Cleanse each day helps to maintain mental clarity and physical wellness. The consistent repair to your internal processes provides a significant boost to the immune system. Deep Cleanses – A deep cleanse is when customers perform a full cleanse day with four servings of Cleanse for Life. Deep cleanses offer a total reset to your system, encouraging digestive tract repair and metabolic function. We recommend performing regular deep cleanses for best results. While you can read article after article about the benefits of Isagenix, the proof is in the results experienced by real people. Isagenix success stories include incredible weight loss, monumental athletic achievement, and remarkable changes in health and wellness. For more information on Isagenix results, check out our page on Isagenix transformations and Isagenix athletes. The only real way to see how Isagenix works and experience the results is by trying Isagenix for yourself. 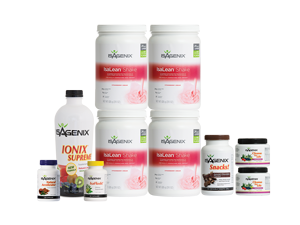 With a wide selection of products for a variety of goals, you can order Isagenix products individually or in discounted packs. A 30-day money-back guarantee on your first order ensures that you can try the products with no risk. Order Isagenix today and experience the myriad health benefits offered by this incredible company!